The Wyckoff House is New York’s oldest structure. Pieter Claesen, an immigrant from Norden, an area now part of Germany who founded what we think of as Wyckoff House, entered America when it was Dutch-controlled, becoming an indentured servant on a farm near Albany. When his servitude ended after 6 years, he relocated to Nieuw Amersfoort, or present-day Brooklyn, and bought the farm and then one-room house of packed earth floors in 1652 now known as Wyckoff House. After the English gained control of New Netherland, residents were required to select surnames that would be passed down generationally. Claesen chose Wykhof, which most of his descendants spell Wyckoff. Pieter and his wife had 11 children; their descendants occupied the Wyckoff House for 8 successive generations. Today, Wyckoff House and Farm is a site for historic interpretation, preservation and education, where contemporary immigrants in East Flatbush and neighboring Canarsie cross paths with New York’s early Dutch history. 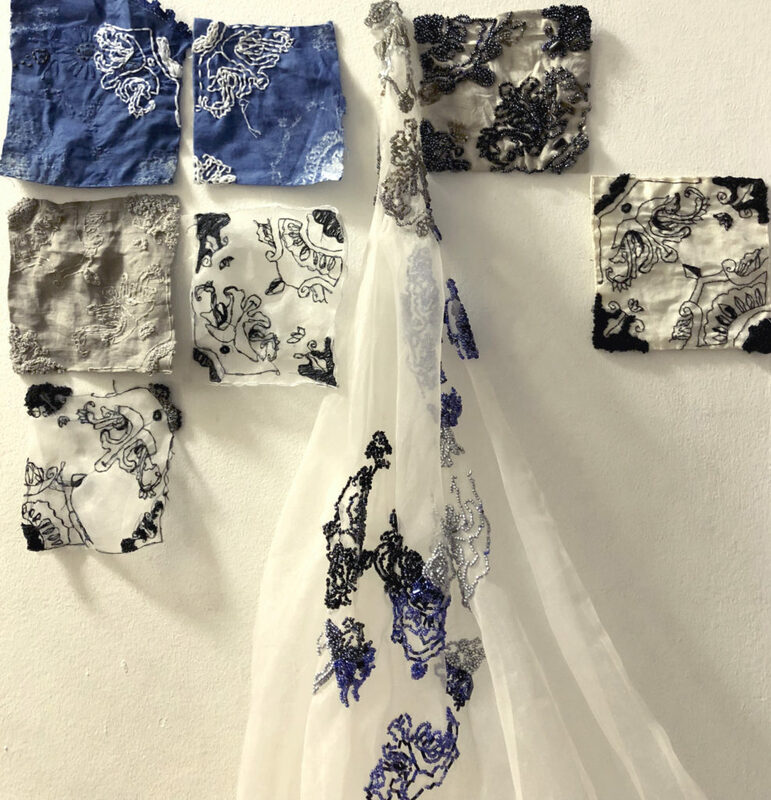 As Artist in Residence, I apply a contemporary art-making lens to this history, using textiles to interpret the design language of early Dutch objects, and to revive traditional textile crops and practices, including flax, a former cash crop, which former farmer, Anna Minsky grew in the summer of 2017. I also introduced several species of indigo to the farm. While not native to the North, tropical indigo was a Southern cash crop in the mid-1700s. Adding indigo to the farm expanded our physical vocabulary with which to talk about formative America’s economic reliance on textile crops, and how colonial power structures including indentured and slave labor continue to shape economic, race and gender power structures today. Below are images of my interpretations of Delft tiles in the Grand Parlor as textiles, and an partial image of the tiles. Blue on white indicated wealth; the purplish black of the Wyckoff House tiles indicated a step down from blue while still communicating economic success. Textile interpretations of Delft tiles at Wyckoff Museum. 2017. Embroidery and beading on undyed and naturally dyed fabrics (acorn and rust; indigo) with “negative” or resist embroidery removed after dyeing. Sizes variable. 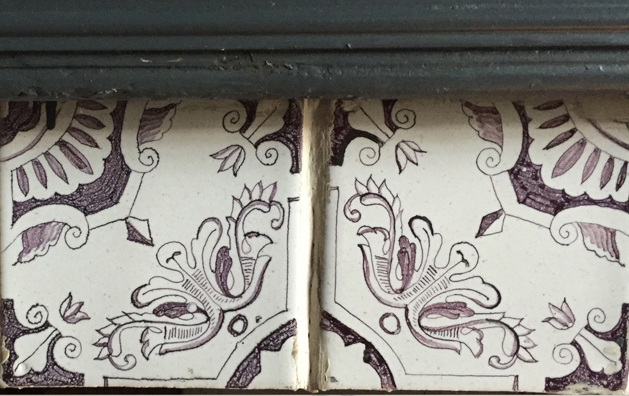 Truncated view of the Delft tiles in the Parlor of the Wyckoff House. These are recreations (the originals are stored! ).